Making the most of your workplace square footage is essential. Thankfully, innovative new furniture solutions provide excellent space saving characteristics for improved functionality. Creative designs and office ingenuity has paved the way for several cutting edge ways to improve any small office area. The use of modular office furniture is a must for any modern business. Modular products will save your business a bundle while allowing significant room for future growth. Top modular collections like the Zira furniture for sale from Global Total Office provide extensive options for areas of any size. Making use of the modular workstations available in 2013 will help to improve your business potential now and in the future. In order to maximize square footage, modular office desks can be easily customized in a variety of sizes to meet specific office shapes and individual user needs. Take the new e5 collection of Mayline Desks for a prime example. These revolutionary products are not only stylish, they offer ample storage, finish options, and space saving features to make the most of your office interior. The training room and meeting area of any business is an important space where square footage is always at a premium. Keeping these two essential areas separate is just plain silly! Awesome new tables for office applications are available that can be easily move and shift to form space saving configurations. Products like the Mayline Sync Table offer a flip top design that allows tables not in use to be nested efficiently along walls. Simply open these mayline tables for a training room when needed and remove them when not! In addition to Mayline Tables, manufacturers like Global provide stylish pre configured sets designed to handle your meeting area needs in one simple package. The Junction line includes a V shaped conference table that offers a totally unique look that's sure to impress. The V shape design helps those spaces with limited length while still allowing you to accommodate a large number of guests. Talk about versatility! In the long run, to make the most of your office space you'll need to remember a few simple principles. First, use modular products. From lobby seating to the hottest new furniture for an executive office, modular components are available designed specifically to improve your business while saving space. Secondly, build up not out. All too often consumers forget about the ability to build up with their furnishings. Wall mount storage options and other popular office items are available to help you make the most of your office footprint. Lastly, go mobile! If products you're considering for your meeting area and conference room are not available with wheels, consider another line! 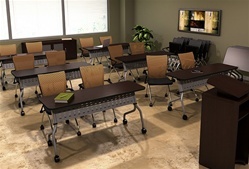 Mobilizing your conference tables and tables for training room use will ensure easy reconfiguring that provides excellent benefits in terms of space and time.